German ‘anti-Islamization’ movement Pegida is expanding into other European nations, with its Danish branch staging its first rally on Monday. Opposition to their message is also growing stronger, as people viewing them as bigots take to the streets. Initially based in Dresden, the self-styled "Patriotic Europeans Against Islamization of the West" (PEGIDA) is spreading its weekly ‘night strolls’ into other European countries. In Copenhagen, the DanishPEGIDAbranch staged its inaugural rally on Monday. Some 200 anti-Islamization activists showed up for the event facilitated with the help of local anti-immigrant organizations. Smaller demonstrations took place in Aarhus, Denmark’s second-largest city, and Esbjerg. "Our goal is to give the middle class a chance to express their worries concerning violent Islam and to send a signal to politicians that we voters are worried," said Nicolai Sennels, organizer of the Danish rally, who previously stood for parliament on an anti-immigrant ticket for the Danish People's Party (DPP). PEGIDA supporters, however, were outnumbered by their opponents. About 5,000 people took part in a counter-rally in Copenhagen, and both gatherings passed off peacefully. Similar numbers of activists were fielded by the two sides in other parts of Denmark, AFP reported. 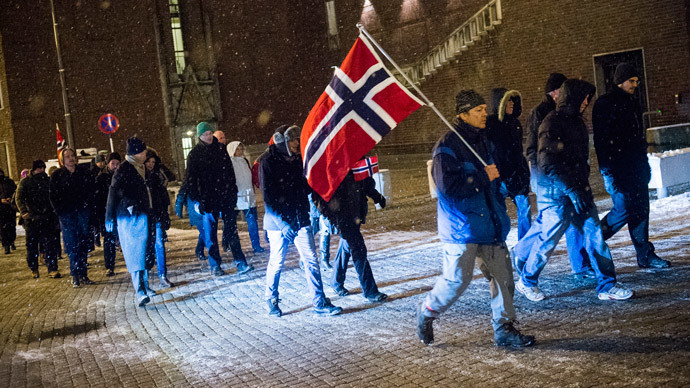 A small PEGIDArally in Oslo attracted around 70 supporters, who gathered for the second event of this kind and faced some 200 opponents, who threw snowballs at them, Norwegian public radio reported. In Dresden, PEGIDA’s unofficial stronghold, the traditional Monday rally had to be skipped. Police banned public gatherings due to “credible” threats against the rally andPEGIDAco-founder Lutz Bachmann. Law enforcers didn’t allowPEGIDA’s critics to stage a protest either. The group called on their supporters to put candles in their windows and hang German flags as a sign of support. Nevertheless, police presence was heavy in the streets of Dresden, with authorities saying they would act if PEGIDAsupporters did gather in their tens of thousands. However, the organization staged demonstrations in other German cities, including Düsseldorf, Kassel and Stralsund. PEGIDA is fighting an uphill battle to go from the fringe of political discourse towards the mainstream. The movement previously joined forces with right-wing groups, including neo-Nazis as it was growing in prominence, but is now trying to distance itself from such affiliations and appeal to the middle class both in Germany and other countries. The movement’s German leadership held a press conference on Monday to moderate PEGIDA’s image and detailed their policy in a six-point plan. They called on Canada-style immigration rules to encourage the inflow of skilled immigrants and curb refugee numbers. They also want permanent expulsion of extremists and an end to what they called Berlin’s"warmongering against Russia and other states." "The press conference is meant to be the start of a dialogue," said PEGIDAspokeswoman Kathrin Oertel, adding that“in coming days there will be talks with representatives of mainstream politics." Earlier German politicians, notably including German Chancellor Angela Merkel, blasted PEGIDAas Islamophobes, who held views contrary to Germany’s core value of tolerance.